Cape Town, South Africa — Nov. 12, 2018 — At AfricaCom 2018, Broadpeak®, a leading provider of content delivery network (CDN) and video streaming solutions for content providers and pay-TV operators worldwide, will showcase its solution for OTT multiscreen video delivery via DVB-T2 networks with SENTECH, a leading Digital Terrestrial Television (DTT) service provider in sub-Saharan Africa. During the demo, SENTECH will rely on Broadpeak’s nanoCDNTM multicast ABR solution and third-party technologies from Teamcast (IP encapsulation / DVB-T2 modulation solution) and Noovo (receiving gateway) to cost-efficiently deliver high-quality video to all screens. During the demo, SENTECH will use Broadpeak’s BkE200 transcaster server to transform unicast streams into multicast. TeamCast will provide a solution that combines its IP encapsulation gateway (SmartGate) and the high-end DVB-T2 modulator (Twister) to deliver the multicast data. 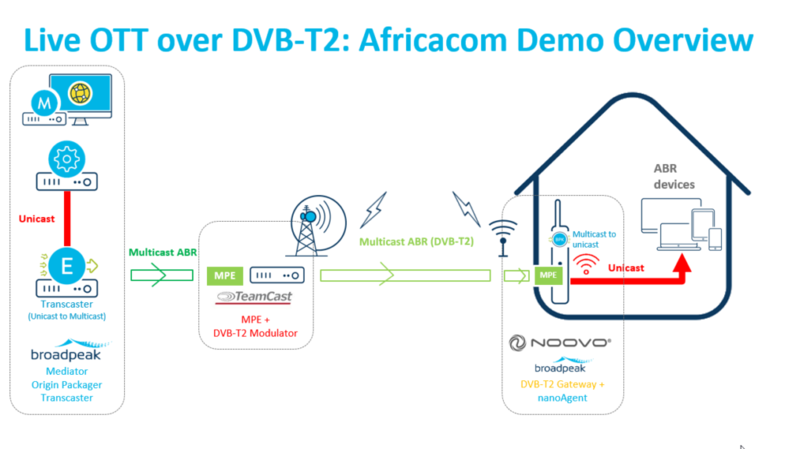 Broadpeak’s nanoCDN agent will be deployed in DVB-T2 home gateways from Noovo to convert multicast streams back into unicast and deliver the content to ABR devices. The solution enables to deliver the video content to virtually millions of simultaneous viewers using a single multicast session over the network. nanoCDN is changing the face of OTT delivery via terrestrial networks by enabling service providers like SENTECH to deliver live and VOD content to STBs and mobile devices in a way that is scalable and cost-effective. Broadpeak will showcase its CDN and video streaming solutions at AfricaCom 2018 Nov. 13-15 in Cape Town at stand K6A (part of the Africa Video Forum). The joint partner demo of OTT video delivery via DVB-T2 networks will take place at the SENTECH stand AVF Networking Hub/M4.